The Japanese city of Hiroshima (広島市, Hiroshima-shi) is the capital of Hiroshima Prefecture, and the largest city in the Chūgoku region of western Honshū, the largest of Japan's islands. Hiroshima was founded on the coast of the Seto Inland Sea in 1589 by Mori Terumoto (毛利 輝元), who was replaced by Masanori Fukushima (福島正則) after Tokugawa Ieyasu won the Battle of Sekigahara in 1600. Hiroshima castle passed to Asano Nagaakira (浅野長晟) in 1619, and descendants of Asano ruled Hiroshima until the Meiji Restoration in 1868. Hiroshima gained the status of a municipality on April 1, 1889 and was officially designated a city on April 1, 1980 by government ordinance. During the Meiji period Hiroshima became an important port and military center. Hiroshima is known throughout the world as the first city in history subjected to nuclear warfare when the United States dropped an atomic bomb on the morning of August 6, 1945. Between 90,000 and 140,000 people lost their lives. 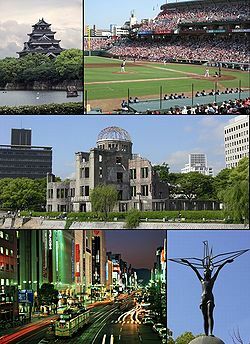 Hiroshima was proclaimed a City of Peace by the Japanese parliament in 1949, and has become a center for international conferences on peace as well as social issues. The city government continues to advocate the abolition of all nuclear weapons. Visitors come from all over the world to meditate at the Hiroshima Peace Memorial Park, opened in 1955 at the epicenter of the atomic blast. The Genbaku Dome (原爆ドーム) or "Atomic Bomb Dome" in the Hiroshima Peace Memorial Park was designated a World Heritage site in 1996. Hiroshima is the capital of Hiroshima prefecture and the largest city in the Chūgoku region of southwestern Honshū, the largest of Japan's islands. Hiroshima, whose name means “Broad Island,” is situated on the delta of the Ota River, whose six channels divide it into several islets. The city is located on Hiroshima Bay of the Inland Sea. As of 2006, the city had an estimated population of 1,154,391, while the total population for the metropolitan area was estimated as 2,043,788 in 2000. he total area of the city is 905.08 km², with a density of 1275.4 persons per km². Around 1910 the population was 143,000. Before World War II, Hiroshima's population had grown to 360,000, and peaked at 419,182 in 1942. Following the atomic bombing in 1945, the population dropped to 137,197. By 1955, the city's population had returned to pre-war levels. Hiroshima was founded on the coast of the Seto Inland Sea in 1589 by Mori Terumoto (毛利 輝元), who made it his capital after leaving Koriyama Castle in Aki Province (安芸国). Terumoto quickly constructed Hiroshima Castle and occupied it in 1593. After Mori was on the losing side at the Battle of Sekigahara (1600), the winner, Tokugawa Ieyasu, deprived him of most of his fiefs including Hiroshima, and gave Aki province to Fukushima Masanori (福島正則), a daimyo who had supported him. The castle passed to Asano Nagaakira( 浅野長晟) in 1619, and Asano was appointed the daimyo of the area. Under Asano’s rule, the city prospered, developed, and expanded, with few military conflicts or disturbances. Asano's descendants continued to rule until the Meiji Restoration in the 19th century. Hiroshima served as the capital of Hiroshima Domain during the Edo period. After the han was abolished in 1871, the city became the capital of Hiroshima prefecture. During the Meiji period Hiroshima became a major urban center as the Japanese economy shifted from primarily rural to urban industries. Ujina Harbor was constructed in the 1880s, allowing Hiroshima to become an important port city. The Sanyo Railroad was extended to Hiroshima in 1894, and a rail line from the main station to the harbor was constructed for military transportation during the First Sino-Japanese War. New industrial plants, including cotton mills, were established in Hiroshima in the late 1800s. Further industrialization in Hiroshima was stimulated during the Russo-Japanese War in 1904, which required development and production of military supplies. The Hiroshima Prefectural Commercial Exhibition Hall was constructed in 1915 as a center for trade and exhibition of new products. Its name was later changed to Hiroshima Prefectural Product Exhibition Hall, and again to Hiroshima Prefectural Industrial Promotion Hall. Atomic Bomb Dome the Hiroshima Peace Memorial, a remnant of the city near ground zero of its nuclear bombardment. During World War II, the Second Army and Chugoku Regional Army were headquartered in Hiroshima, and the Army Marine Headquarters was located at Ujina port. The city also had large depots of military supplies, and was a key center for shipping. 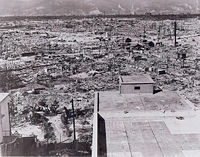 The bombing of Tokyo and other cities in Japan during World War II caused widespread destruction and over 200,000 deaths, nearly all civilians. There were numerous such air raids on Hiroshima. To protect against incendiary bombs in Hiroshima, students were mobilized to demolish houses and create firebreaks. On Monday, August 6, 1945, the nuclear weapon Little Boy was dropped on Hiroshima by the crew of the American B-29 bomber Enola Gay, directly killing an estimated 80,000 people. By the end of the year, injury and radiation sickness brought the total number of casualties to 90,000-140,000. Approximately 69 percent of the city's buildings were completely destroyed, and 6.6 percent severely damaged. Research on the effects of the attack was restricted under Allied occupation, and information was censored until the signing of the San Francisco Peace Treaty in 1951, restoring control to the Japanese. On September 17, 1945, Hiroshima was struck by the Makurazaki Typhoon (Typhoon Ida), one of the largest typhoons of the Shōwa period. Hiroshima prefecture suffered more than three thousand deaths and injuries, about half the national total. More than half the bridges in the city were destroyed, along with heavy damage to roads and railroads, further devastating the city. Hiroshima was rebuilt after the war, with the help from the national government through the Hiroshima Peace Memorial City Construction Law passed in 1949. It provided financial assistance for reconstruction, along with donated land that had previously been owned by the national government and used for military purposes. Several U.S. civic leaders and scholars were consulted about the city-planning project. Reconstruction began about 1950 with the rebuilding of the Inari Bridge. Hiroshima Castle was restored in 1957 and houses a museum of city history. In 1949, a design was selected for the Hiroshima Peace Memorial Park, to be located at the epicenter of the atomic blast. Hiroshima Prefectural Industrial Promotion Hall, the closest surviving building to the location of the bomb's detonation, was designated the Genbaku Dome (原爆ドーム) or "Atomic Bomb Dome," as part of the Hiroshima Peace Memorial Park. It was designated a United Nations World Heritage site in 1996. The Hiroshima Peace Memorial Museum was opened in 1955 in the Peace Park. A cenotaph shaped like an enormous saddle, resembling the small clay saddles placed in ancient Japanese tombs, contains a stone chest with a scroll listing the names of those killed. The Japanese architect Tange Kenzo designed the museum and cenotaph, and the American artist Isamu Noguchi sculpted two peace bridges for the park. Every August 6, a commemorative service is held at the park. 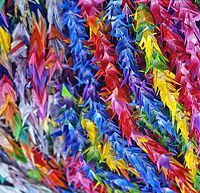 Millions of origami paper cranes, the Japanese symbol of longevity and happiness, are heaped about the Children's Peace Memorial throughout the year. 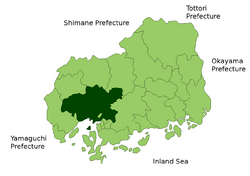 Hiroshima is the industrial center for the Chūgoku-Shikoku region, and is centered along the coast. Hiroshima has long been a port city and goods are shipped both through Hiroshima port and Hiroshima International Airport. Industries in Hiroshima include the production of steel, automobiles, rubber, chemicals, ships, and transport machinery. The city is Japan's major supplier of needles. Hiroshima’s largest industry is the manufacture of cars (Mazda), car parts and industrial equipment. Mazda Motor Company, now controlled by the Ford Motor Company, is Hiroshima's dominant company, accounting for 32 percent of Hiroshima's GDP. Mazda produces many models in Hiroshima for worldwide export, including the popular MX-5/Miata, Mazda Demio(Mazda2), Mazda CX-9 and Mazda RX-8. The Mazda CX-7 has been built there since early 2006. General machinery and equipment also account for a large portion of Hiroshima’s exports. To support these industries, Hiroshima has many innovative companies engaged in the research and development of new technologies, such as Hiroshima Vehicle Engineering Company (HIVEC). Some of these companies hold the top market share in their industry, or are alone in their particular field. Tertiary industries in the wholesale and retail areas are also very developed. The concentration of industry in Hiroshima has brought together skilled personnel and fundamental technologies, making it attractive to business. Business setup costs are lower than in other large Japanese cities, and there is a comprehensive system of tax breaks for companies which relocate to Hiroshima. The Hiroshima Station Urban Development District and the Seifu Shinto area offer capital installments (up to 501 million yen over 5 years), tax breaks and employee subsidies. Seifu Shinto, which translates as “West Wind, New Town,” the largest construction project in the region, is an attempt to build "a city within a city," providing places to work, play, relax and live. Hiroshima was recently added to Lonely Planet's list of the top cities in the world. Commuting times rank amongst the shortest in Japan and the cost of living is lower than other large cities in Japan such as Tokyo, Osaka, Kyoto, or Fukuoka. Hiroshima has a professional symphony orchestra, which has performed at Wel City Hiroshima since 1963. 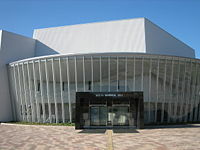 There are also many museums in Hiroshima, including the Hiroshima Peace Memorial Museum, along with several art museums. The Hiroshima Museum of Art, which has a large collection of French Renaissance art, opened in 1978. The Hiroshima Prefectural Art Museum opened in 1968, and is located near Shukkei-en (縮景園) gardens. The Hiroshima City Museum of Contemporary Art, which opened in 1989, is located near Hijiyama Park. Festivals include Hiroshima Flower Festival and Hiroshima International Animation Festival. Hiroshima Peace Memorial Park, which includes the Hiroshima Peace Memorial, draws many visitors from around the world, especially for the Hiroshima Peace Memorial Ceremony, an annual commemoration held on the date of the atomic bombing. The park also contains a large collection of monuments, including the Children's Peace Monument and the Hiroshima National Peace Memorial Hall for the Atomic Bomb Victims. Hiroshima's rebuilt castle (nicknamed Rijō, meaning Koi Castle) houses a museum of life in the Edo period. Hiroshima Gokoku Shrine is within the walls of the castle. 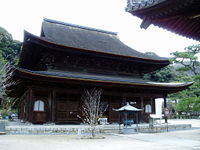 Other attractions in Hiroshima include Shukkei-en, Fudōin, Mitaki-dera (三瀧寺), and Hijiyama Park. 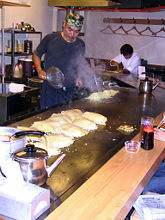 Hiroshima is known for okonomiyaki, a type of elegant omelette/pancake cooked on a hot-plate (usually right in front of the customer). It is cooked with various ingredients, which are layered rather than mixed together as in the Osaka version of okonomiyaki. The layers are typically egg, cabbage, bean sprouts, sliced pork/bacon with optional items (mayonnaise, fried squid, octopus, cheese, mochi, kimchi, and so on), and noodles (soba, udon) topped with another layer of egg and a generous dollop of okonomiyaki sauce. The cabbage is piled very high and is generally pushed down as it cooks. The order of the layers may vary slightly depending on the chef's style and preference, and ingredients will vary depending on the preference of the customer. The Chugoku Shimbun, the local newspaper serving Hiroshima, publishes both morning paper and evening editions. Television stations include Hiroshima Home TV, Hiroshima TV, TV Shinhiroshima, and the RCC Broadcasting Company. Radio stations include HIROSHIMA FM, Chugoku Communication Network, FM Fukuyama, ITSUKAICHI Community Broadcast, and Onomichi FM. Hiroshima is also served by NHK, Japan's public broadcaster, with television and radio broadcasting. Hiroshima is home to several professional and non-professional sports teams. Baseball fans immediately recognize the city as the home of the Hiroshima Toyo Carp. Six-time champions of Japan's Central League, the team has gone on to win the Japan Series three times. Kohei Matsuda, owner of Toyo Kogyo, was primary owner of the team from the 1970s until his death in 2002. 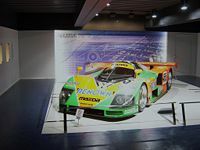 The team is now owned by members of the Matsuda family, while Mazda has minority ownership of the team. The Carp play at Hiroshima Municipal Stadium, which was built in 1957 in central Hiroshima, near the A-Bomb Dome. The city is planning a new baseball stadium near the JR Hiroshima Station, to be ready in time for the 2009 season.. Sanfrecce Hiroshima is the city's J. League football team. In 1994, the city of Hiroshima hosted the Asian Games. Hiroshima University was established in 1949, as part of a national restructuring of the education system, when one national university was set-up in each prefecture. Hiroshima University combined eight existing institutions and added the Hiroshima Prefectural Medical College in 1953. Local public transportation in Hiroshima is provided by a streetcar system, operated by Hiroshima Electric Railway called "Hiroden" (広電, "Hiroden") for short. Hiroden also operates buses in and around Hiroshima Prefecture. Hiroshima Electric Railway was established on June 18, 1910 in Hiroshima. While many other Japanese cities had abandoned streetcar systems by the 1980s, Hiroshima retained its system because the construction of a subway system on the delta where the city is located would be too costly. During the 1960s, Hiroshima Electric Railway, or Hiroden, bought extra streetcars from other Japanese cities. Although streetcars in Hiroshima are now being replaced by newer models, most retain their original appearances. The Hiroshima streetcar system is sometimes called a "Moving Museum" by railroad buffs. Of the four streetcars that survived the war, two were still in operation in July, 2006 (Hiroden Numbers 651 and 652). There are seven streetcar lines, many of which terminate at Hiroshima Station. The Astram Line opened for the 1994 Asian Games in Hiroshima, with one line from central Hiroshima to Seifu Shinto and Hiroshima Big Arch, the main stadium of the Asian Games. Astram uses rubber-tired metro cars, and provides service to areas in the suburbs that are not served by Hiroden streetcars. The Skyrail Midorizaka Line is a monorail that operates between Midoriguchi and Midori-Chūō, making three stops. The West Japan Railway Company (JR West)'s Hiroshima Station offers inter-city rail service, including Sanyō Shinkansen which provides high speed service between Shin-Ōsaka and Fukuoka. Sanyō Shinkansen began providing service to Hiroshima in 1975, when the Osaka-Hakata extension opened. Other rail service includes the Sanyō Main Line, Kabe Line, Geibi Line, and Kure Line. Ferries are operated by JR Miyajima Ferry and Miyajima Matsudai Kisen to Miyajima. Hiroden provides service to Miyajimaguchi Station, which is located near the ferry terminal for service to Miyajima. Hiroshima Port is the main passenger ferry terminal for Hiroshima, with service to Etajima, Matsuyama, and other destinations. There is also an international ferry terminal which has service to Busan and Ulsan in South Korea, Shanghai, Dalian, Qingdao and Ningbo in China, Keelung and Kaohsiung in Taiwan, as well as Hong Kong. There is also a boat taxi service that runs along the Ota River channels into the city center. Within Japan, Hiroshima has a similar relationship with Nagasaki which also suffered by an atomic bomb. ↑ Population of Japan, Table 92 Statistics Bureau Retrieved August 25, 2008. ↑ 2.0 2.1 2.2 2006 Statistical Profile The City of Hiroshima Retrieved August 25, 2008. ↑ The Origin of Hiroshima Hiroshima Peace Culture Foundation. Retrieved August 25, 2008. ↑ U. S. Strategic Bombing Survey: The Effects of the Atomic Bombings of Hiroshima and Nagasaki June 1946, United States Strategic Bombing Survey nuclearfiles.org Retrieved August 20, 2008. ↑ Japan in the Modern Age and Hiroshima as a Military City The Chugoku Shimbun Retrieved August 25, 2008. ↑ The Atomic Bombing of Hiroshima, U.S. Department of Energy, Office of History and Heritage Resources retrieved August 19, 2008. ↑ Radiation Effects Research Foundation Retrieved August 19, 2008. ↑ Makurazaki Typhoon. Retrieved August 20, 2008. ↑ Peace Memorial City, Hiroshima Hiroshima Peace Culture Foundation Retrieved August 25, 2008. ↑ Fifty Years for the Peace Memorial Museum Hiroshima Peace Memorial Museum Retrieved August 25, 2008. ↑ Mayors for Peace Mayors for Peace 2020 Vision Campaign Retrieved August 19, 2008. ↑ J. Parker, In Praise of Japanese Engineering; In Praise of Hiroshima. Circuits and Systems. 2004 (47th Midwest Symposium on Circuits and Systems, volume 1. ↑ Wel City Hiroshima. Retrieved August 20, 2008. ↑ Carp owner dies The Japan Times, July 12, 2002. Retrieved August 20, 2008. ↑ Wayne Graczyk, The Japan Times, March 4, 2007 New stadium in Hiroshima looking good for 2009 season, Japantimes.co.jp Retrieved August 19, 2008. ↑ History of Hiroshima University Hiroshima University Retrieved August 25, 2008. ↑ Astram Line Design Soken Hiroshima Inc. Retrieved August 25, 2008. ↑ Shinkansen japan-guide.com Retrieved August 25, 2008. ↑ City of Hiroshima 広島市の姉妹・友好都市, Introduciton ot Our Sister Cities Retrieved August 19, 2008. Hachiya, Michihiko, and Warner Wells. Hiroshima diary; the journal of a Japanese physician, August 6-September 30, 1945. Chapel Hill: University of North Carolina Press. 1955. Hiroshima Peace Memorial (Genbaku Dome). Hiroshima, Japan: Hiroshima Peace Culture Foundation, 1997. Hiroshima: International Peace Culture City. Hiroshima: Hiroshima City Office, Tourism Section, 1975. Ishikawa, Eisei, David L. Swain, translators. Hiroshima and Nagasaki: The Physical, Medical, and Social Effects of the Atomic Bombings. (original 1979). reprint ed. New York: Basic Books. 1999. Jacobs, Norman. The Origin of Modern Capitalism and Eastern Asia. Hongkong: Hong Kong U.P. ; Oxford U.P, 1958. Kosakai, Yoshiteru. Hiroshima Peace Reader. Hiroshima: Hiroshima Peace Culture Foundation, 1980. Rozakis, Laurie E. 1994. Hiroshima (John Hersey). Novel ideas plus active reading guide. Littleton, MA: Sundance Publishers & Distributors. 1994. Terry, T. Philip. Terry's Japanese Empire. Boston: Houghton Mifflin Co., 1914. 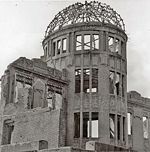 Nuclear Files.org Comprehensive information on the history, and political and social implications of the US atomic bombings of Hiroshima and Nagasaki. This page was last modified on 9 January 2018, at 15:59.